Every voice actor’s journey is different. So I thought it would be fun to highlight the journeys of some of the voice actors I know and respect. What does it take to be a voice actor? 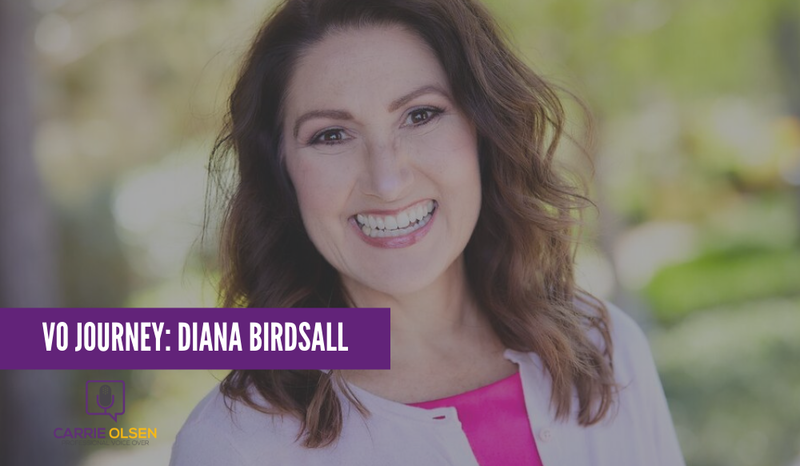 Find out what it took for Diana Birdsall to become a full-time, working pro. Check her out at DianaBirdsall.com. When did you first discover voiceover?I went to Emerson College which is a communications school so I was on the radio at 18 years old, so pretty early on. My second job out of college I started voicing the real estate show I was producing. How did you make the decision to pursue it?I didn’t make the decision to make VO my full time gig until I had spent 13 years as a Creative Director with Time Warner producing commercials. I got a bit burnt out doing that and then decided to have a go at VO since I already knew how to voice commercials. 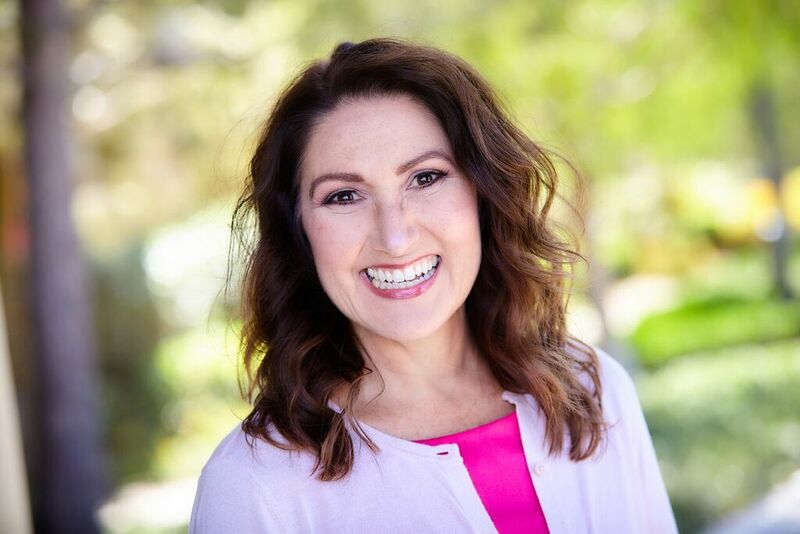 What was the first step you took to get started?I joined the most popular P2P and did only that for a year before I found Jonathan Tilley’s business class on how to build your list and stop auditioning like a mad person. What has your coaching experience been like?Truthfully, not a ton. 3 private sessions with David Goldberg who I like as a coach because he’s very technical. I’ve done a few private sessions with Everett Oliver and then a I belong to a weekly workout group called VO Heaven WoW Workouts run by Larry Hudson which gave me some great experience performing and directing on each workout. How did you balance working on your voiceover business with your other daily obligations?Voice over is my full time business so I’m basically in my studio from 9 am to 5pm ish every day. Describe your voiceover business now. My VO business is a mix of Commercial, Explainer, eLearning and IVR work now. What has been the hardest part about building your voiceover business?The Roller Coaster Effect. It’s like a box of chocolates, you never know what you are going to get month to month. I am very blessed to have repeat customers and that is where 75% of my business is coming from right now. Getting enough clients who send you semi regular work is the most difficult part of VO. It took me 5 years to get to that point. I auditioned like a crazy person for those first few years building up my business. 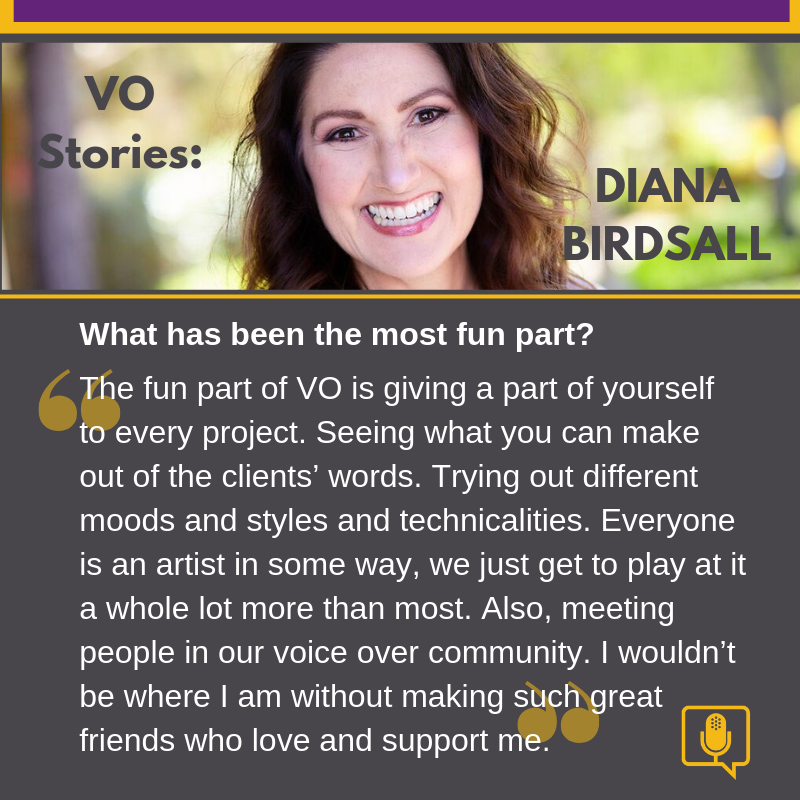 What has been the most fun part?The fun part of VO is giving a part of yourself to every project. Seeing what you can make out of the clients’ words. Trying out different moods and styles and technicalities. Everyone is an artist in some way, we just get to play at it a whole lot more than most. Also, meeting people in our voice over community. I wouldn’t be where I am without making such great friends who love and support me. If you could give advice to yourself when you were just getting started, what would it be?Take a business course first! Make sure you have the skills and the tools to support yourself. Be sure to vet ANY coaches, classes or products with seasoned professionals before diving in. I’ve been burned by a ‘coach’ and lost $500. Due Diligence is KEY. Anything else you would like to add?Simplicity, ease and fun should be part of every job you do. Relax, drop your shoulders and project your personality. Thank you for sharing your journey, Diana! The new course, Get Traction in Voiceover (Even if You Have a Full-Time Job) launches soon.